Cardiac resynchronization therapy (CRT) has been established as a treatment for patients with chronic heart failure (HF). We tested the hypothesis that assessment of coronary flow reserve (CFR) predicts the long-term outcome of CRT. 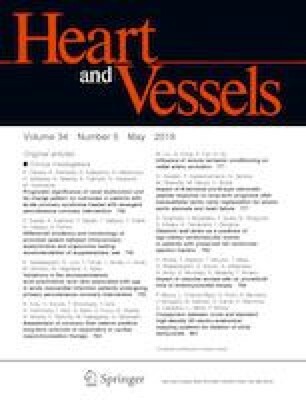 The study consisted of 114 HF patients implanted with a CRT device for the treatment of advanced HF between April 2010 and April 2018. After excluding patients that withdrew from long-term follow-up and patients missing a baseline CFR measurement, we enrolled 53 eligible patients. CFR was determined non-invasively by transthoracic echocardiography. Based on the ROC curve for predicting the appearance of major adverse cerebral and cardiovascular events (MACCE), the level of preserved CFR was set at >1.35 in responders. Accurate follow-up information (mean 873 ± 498 days) was obtained in 23 patients with a preserved CFR (16 females; mean age 71 ± 7.9 years) and 11 patients with a depressed CFR (5 females; mean age, 73 ± 7.6 years) in responders. Kaplan–Meier survival analysis demonstrated that the depressed CFR group had a higher prevalence of MACCE than the preserved CFR group (log rank, 9.83; p = 0.0021). Multivariate analysis revealed that depressed CFR was associated with MACCE (hazard ratio 4.88, 95% confidence interval 1.13–26.5, p = 0.0329). Our results suggest that the assessment of CFR predicts the outcome in responders to CRT. Preservation of coronary circulation flow might underlie one of the mechanisms for a better response to CRT in responders. There was no financial support for the present study.